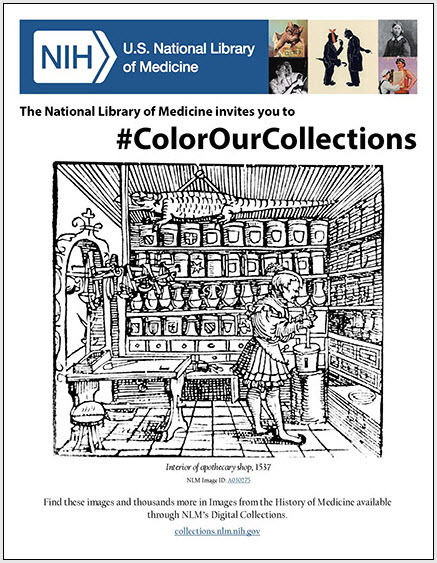 IHM is available through NLM Digital Collections, a free online resource of biomedical books and still and moving images. Images from the History of Medicine is also available in Open-I®, which enables search and retrieval of abstracts and images from open source literature and biomedical image collections as well as access through an API. Open-I® allows you to search for images based on keywords in associated metadata or by features of the images themselves or a combination. You can upload your own images in order to find similar or related images. Open-I®was developed by the Lister Hill National Center for Biomedical Communications (LHNCBC) at NLM. Public domain images from the NLM historical collections are now accessible through The Commons on Flickr via a photostream. You can search hundreds of images of book illustrations, photographs, fine art work, ephemera, and posters. Images are also grouped into albums (collections of images) including selections from the book Hidden Treasure, patent medicine trade cards, and AIDS posters. We encourage you to contribute information about images by adding comments and tags. It is the users’ responsibility to determine compliance with the law when reproducing, transmitting, or distributing images found in IHM. Some content in this database may contain material that some viewers may find to be challenging, disturbing or offensive. Viewer discretion is advised.